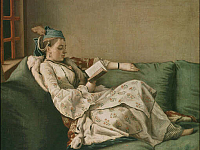 Liotard was a versatile artist born in Switzerland; he was active in France, Switzerland, Italy, Austria, England and Turkey as well. He was accomplished in portraits, pastels and printmaking, additional to being a writer. His portraits were representations of religious figures, royalty, ordinary models and self-portraits. In Italy in painted portraits of Pope Clement XII (1652 -1740) and other clergymen while in Rome. He also traveled to Vienna, where he was commissioned by Royal families. His exquisite, soft tones used in portraits are exampled by his work, Marie Adelaide of France, (1752) the daughter of King Louis XV (1710 – 1774), now in the Uffizi Gallery. A year after he executed this work in France he traveled to England where he painted a portrait of Augusta of Saxe-Gotha, Princess of Wales (1719 – 1772). His painting style intimately captured a tender and realistic representation of his subjects. Later settling in his birthplace of Geneva, he wrote Traité des Principes et règles de la Peinture (Treatise on the Art of Painting), in which he claimed painting ought to be a mirror of nature. This strong belief is seen prominently in his portraits, but also in still-life works and landscapes he painted later in life.